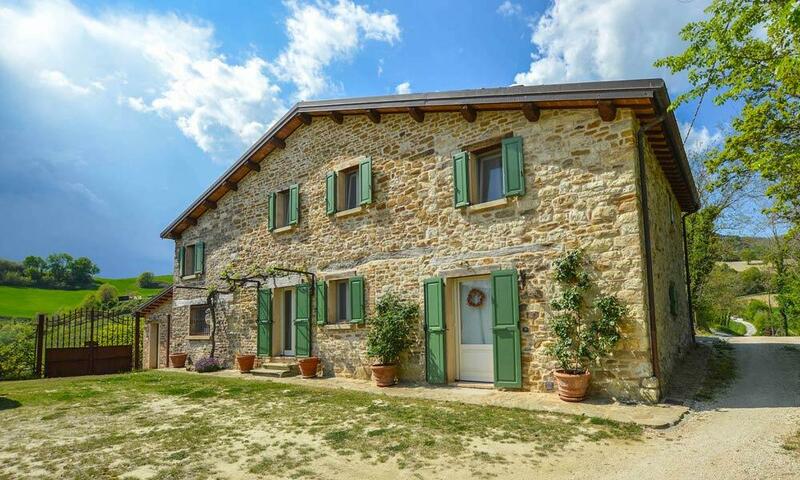 In a small hamlet of just 3 houses, a few kilometers from Macerata Feltria, nestled in the hinterland of Urbino – northern Marche, a beautiful farmhouse has been recently restored with great taste. 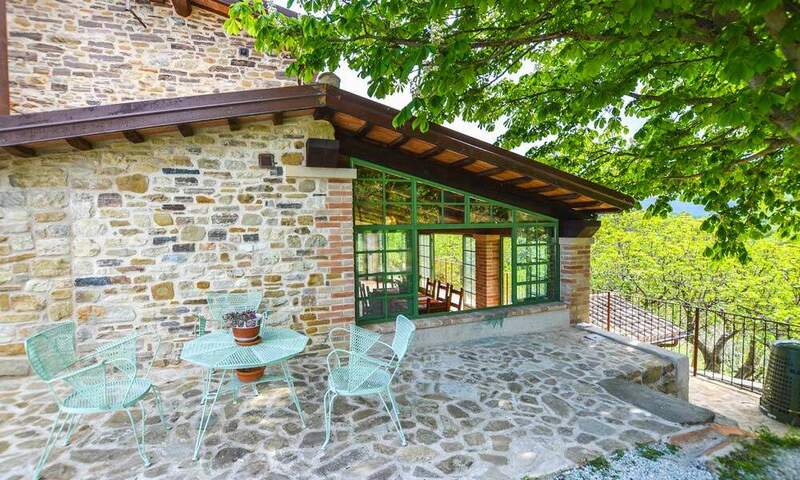 According to the rural architectural tradition of Le Marche, the current owners, together with the architect, have decided to preserve the style. 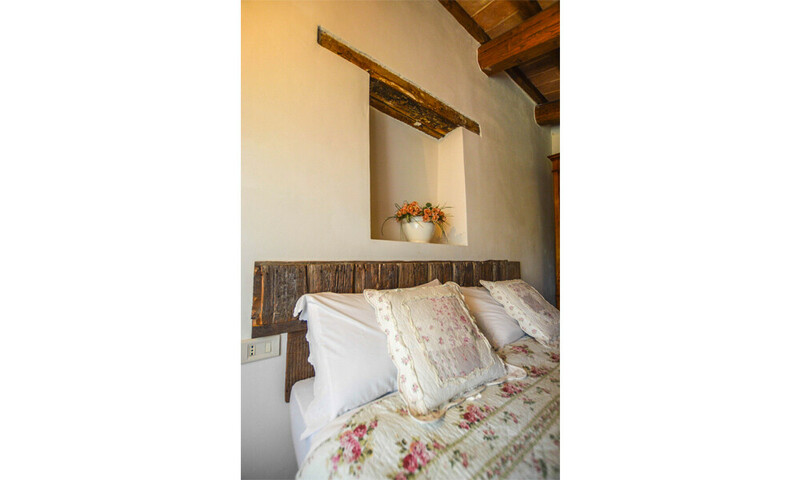 Everything in here is redolent of the past: the materials and finishes used, on one hand respect the tradition, on the other hand, they give an unaltered aesthetic charm to the property, together with all modern comforts. Via a private road you get to the little hamlet square, now a common yard, where guests and occasional visitors can park their vehicles. The land attached to the property is fully fenced and enjoys an electric gate, both for vehicles and pedestrians, for private owners access. The farmhouse, as clearly visible from the facade and construction system, consists of a central body dating back to the 1600s, while the two lateral wings have been added over the next century. 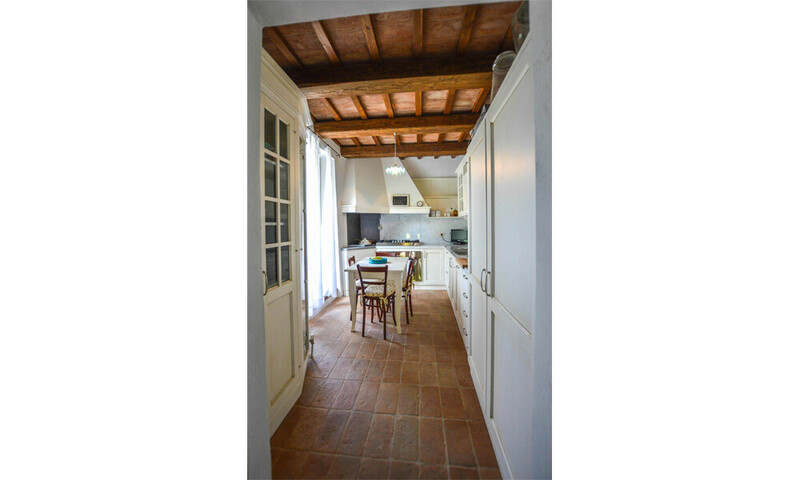 These areas have been well-connected, thanks to the clever renovation made by the current owners, which have created a harmonious path, connecting the various levels on the ground floor, where the entire living area is built. 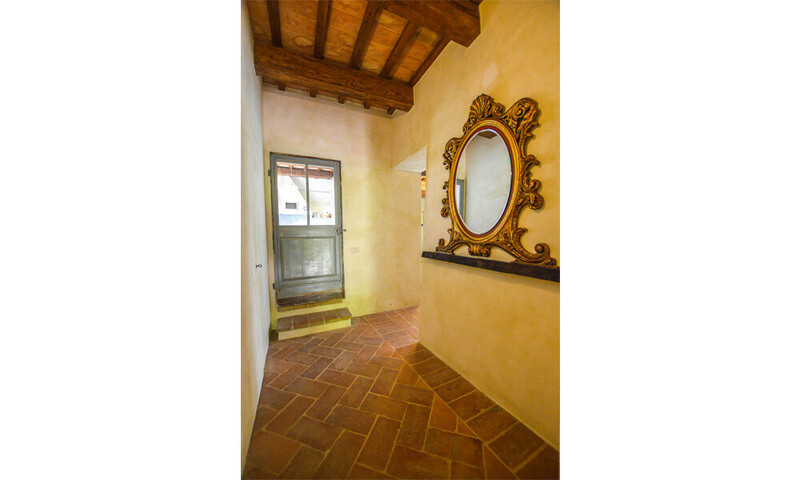 From the main entrance facing the yard, you access a hall, giving access to different areas of the house: on the left a door will lead you to the spacious and traditional living room. 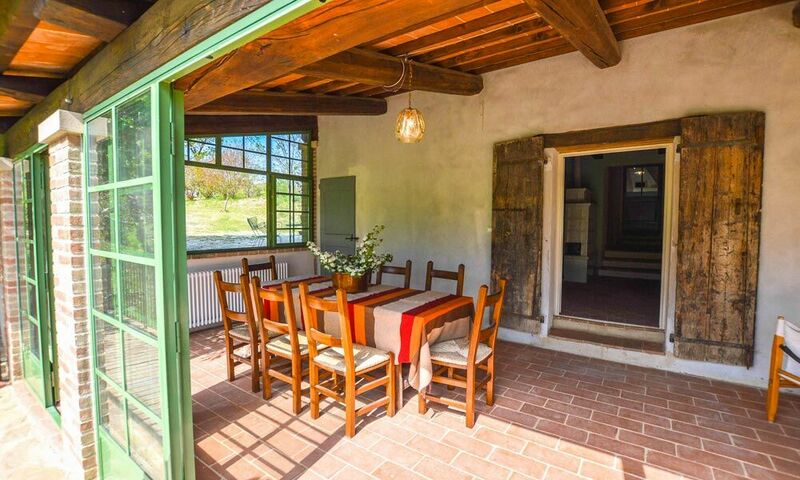 Plenty of light is guaranteed, thanks to the two large french windows. 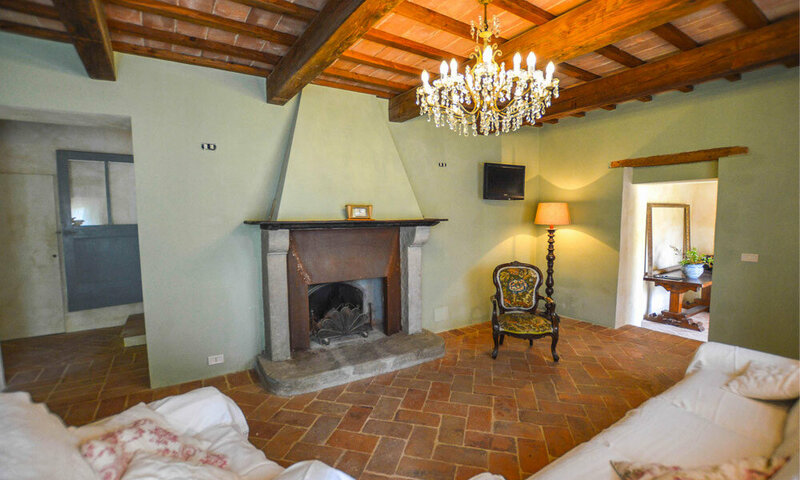 The large central fireplace was expertly restored with a minimal taste but always respecting the tradition of Le Marche rural architecture. Respect for the history of the building is also reflected in the choice of materials and in the successful attempt to recover as much as possible without distorting or altering its value. 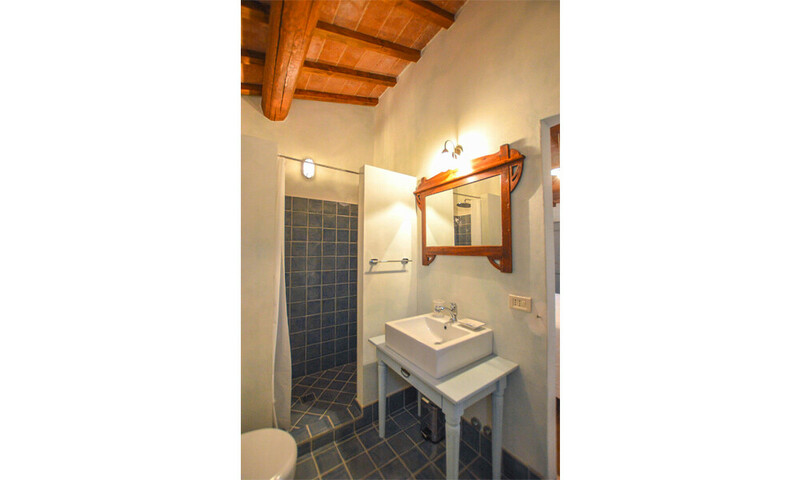 For this reason in all levels of the ground floor, we find a pavement made of original terracotta tiles, cleansed and hand-sanded by expert bricklayers, ceilings characterised by wood beams and planks. From the living room, through a hallway, you access the kitchen to the right and the large dining room to the left. Stepping up on the right, you will immediately notice the large, custom-made, fully-equipped kitchen with all the next generation appliances. 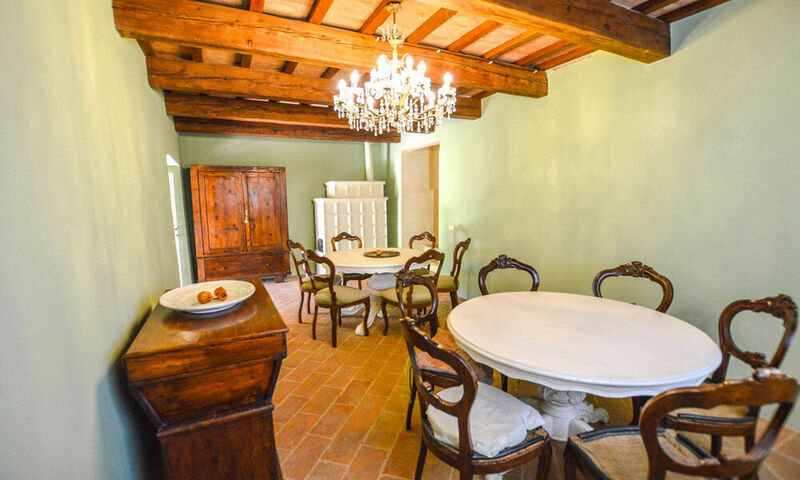 In this room there is space for a small table for a frugal lunch or dinner. From the kitchen, you have direct exit out to the back garden. Walking back to the entrance hall, on the right, a sliding door will lead you to a laundry room and storage, useful to keep all you need to clean the house. 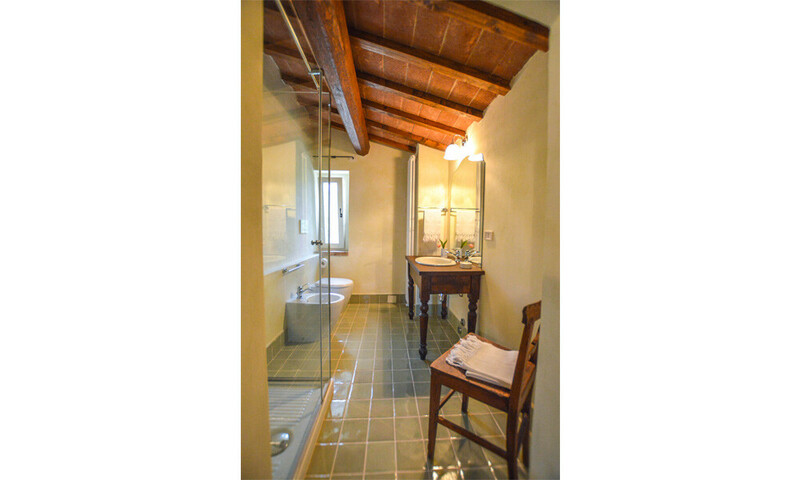 Still on the left, you can see a staircase leading to the upper floor, with a double bedroom with en-suite bathroom, excellent for your guests. Going further, you step down two steps and you get to the large dining room where you can place 2 round tables for a total of 12 diners. In this environment you will notice immediately a stunning Stube wood stove that is lit only in the coldest winter periods to support the radiators, whose system is powered by a solar gpl boiler. Basically, for the every day heating you can use the gpl heating system, while during the coldest days or for particularly cold days off season, you can turn on the wood stove. In the summer, the solar panels warm up the water and sanitary system. 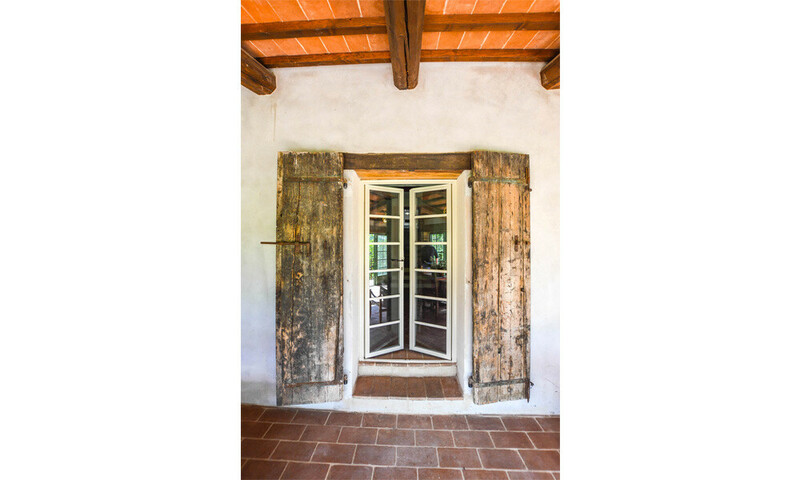 A peculiarity, unlikely to be found in other farmhouses, is the beautiful glazed veranda. 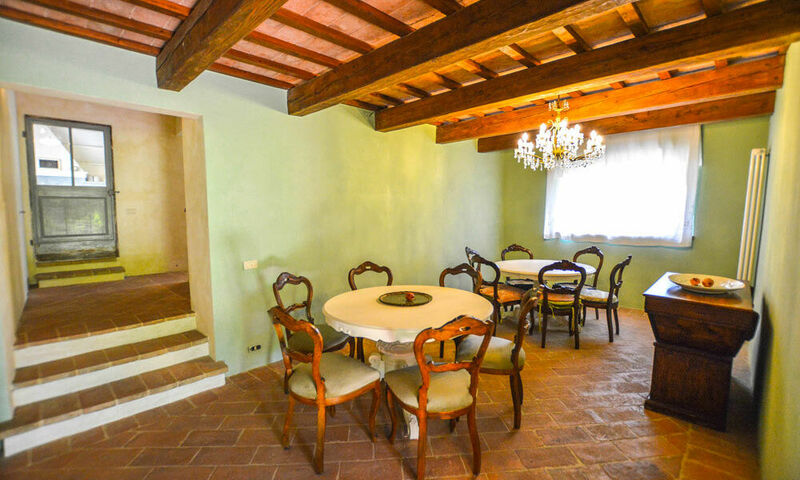 You can reach this room stepping down from the dining room and you’ll immediately feel one with the garden and the nature surrounding the property. 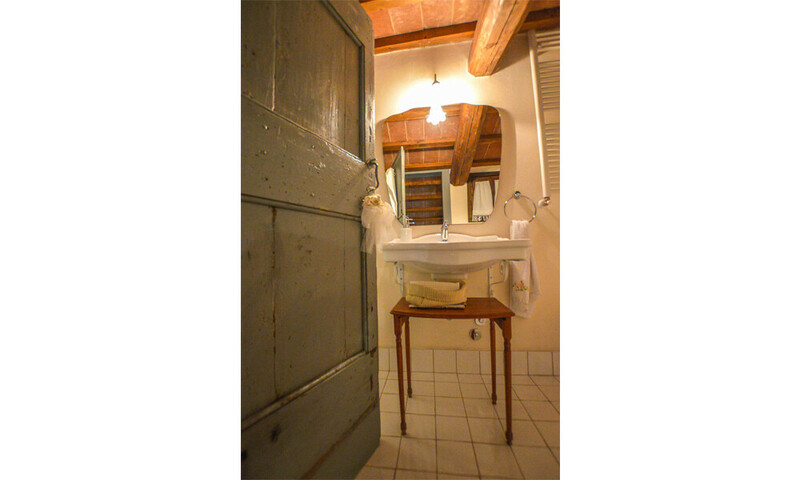 In addition to being a spacious, bright and airy space, easy to use both in the summer and in the winter, this area is also provided with a bathroom, which is accessed via a beautiful antique door. 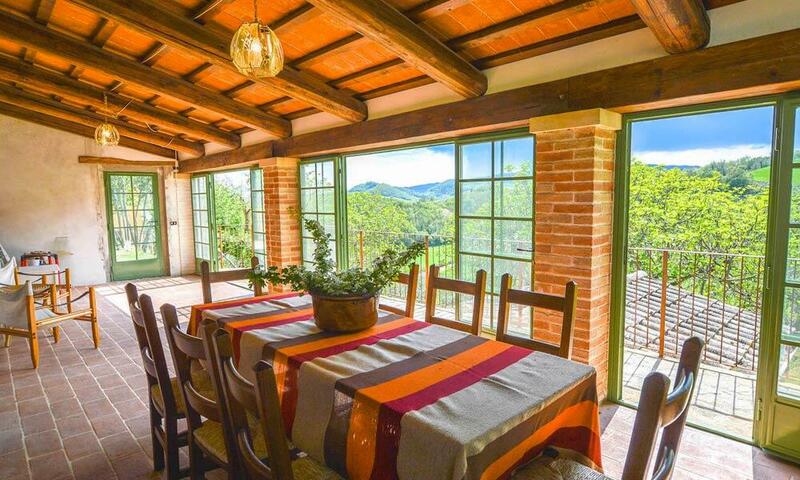 From the veranda you have a beautiful 180° degree view across the valley. From the living room, you step up a staircase leading to the first floor where the entire sleeping area develops. 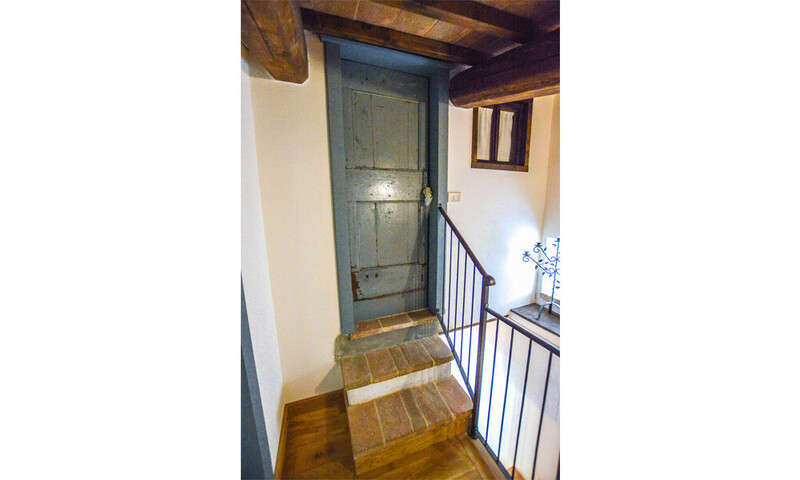 At the end of the stairs you will reach a small mezzanine where a relax-reading area with 2 armchairs and a coffee table has been created; from here you access 3 bedrooms, all with private bathroom. 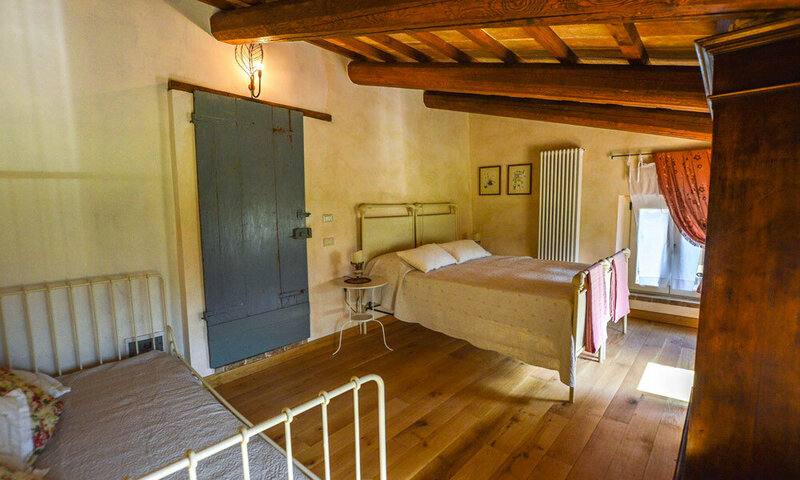 This floor is characterised by a natural oak flooring in all rooms and in the access hallway, while bathrooms have been made with ceramic tiles, with small square tiles, recalling traditional materials. 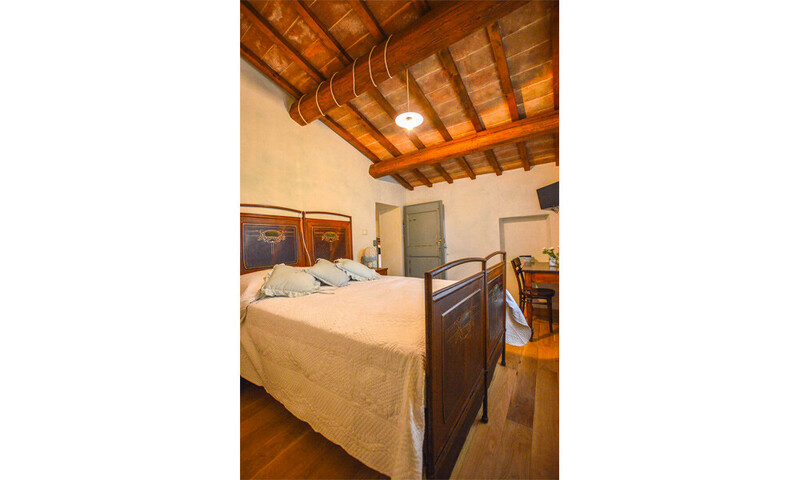 The roof plays the role of a kind of big, beautiful frame, thanks to its wood beams and exposed terracotta tiles, all of them recovered from the original structure. 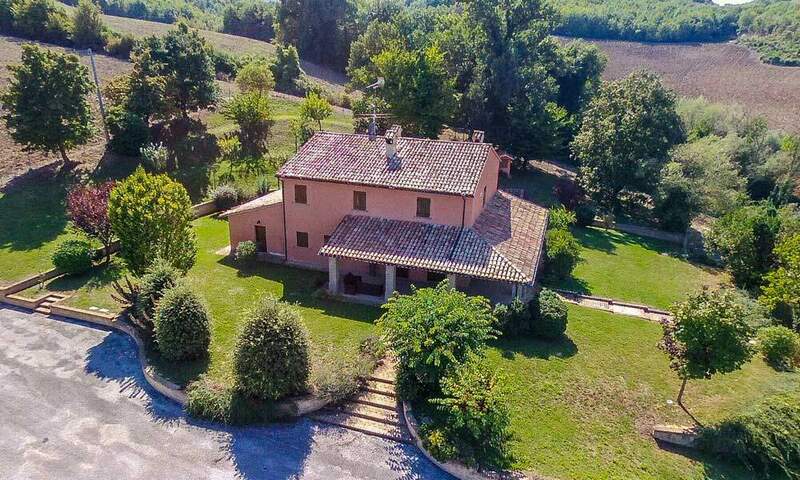 Externally, in addition to the common yard, the property enjoys an exclusive garden of approximately 2.336 sq.m., accessible, as mentioned above, from the gates. From here, you can reach the kitchen and a technical room. 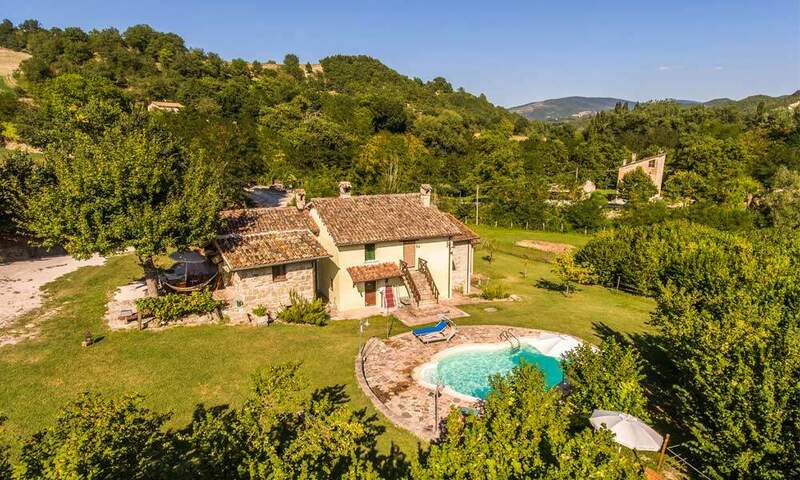 On a higher level, where you can find an additional tool storage, you could build a lovely infinity pool, thanks to the plain ground and the beautiful views. The exclusive garden extends out to the veranda and is characterised by small natural terraces. In the first terrace, there is a small building, separate from the main home, used as a storage. 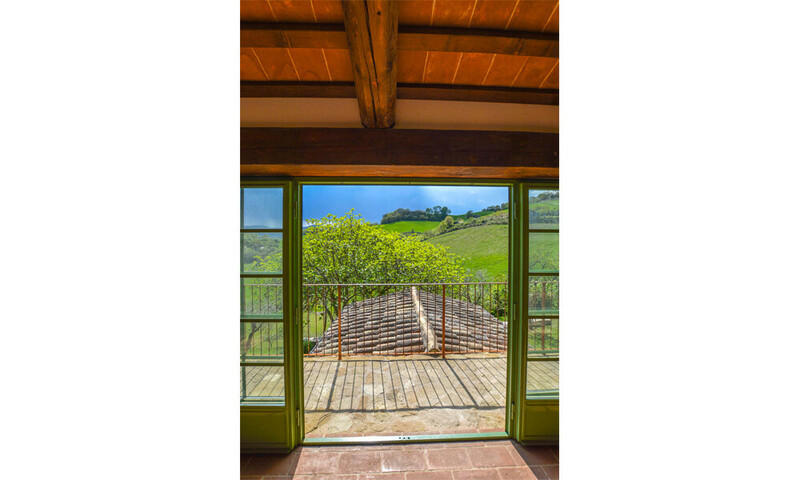 On lower levels there are other terraces where an olive grove with 50 trees was planted for the production of olive oil for personal consumption. 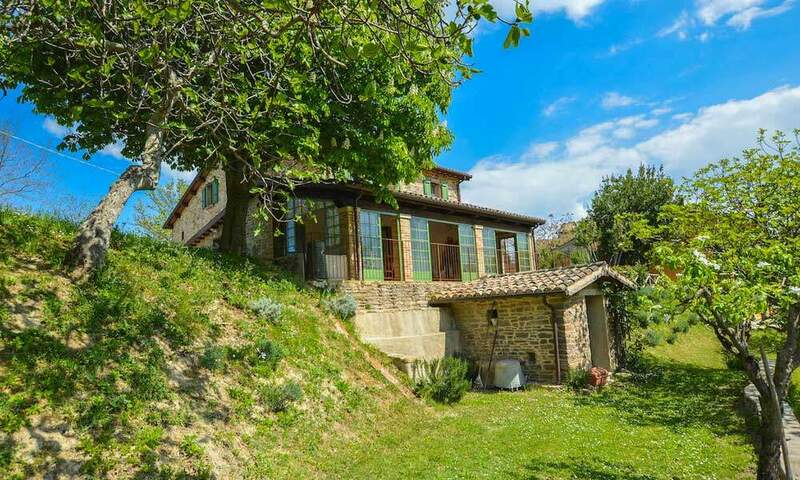 The location of the house is quiet but not isolated: it is perfect for families with kids, who’d like to live in a nice environment, with a few neighbours but still very close to nature. 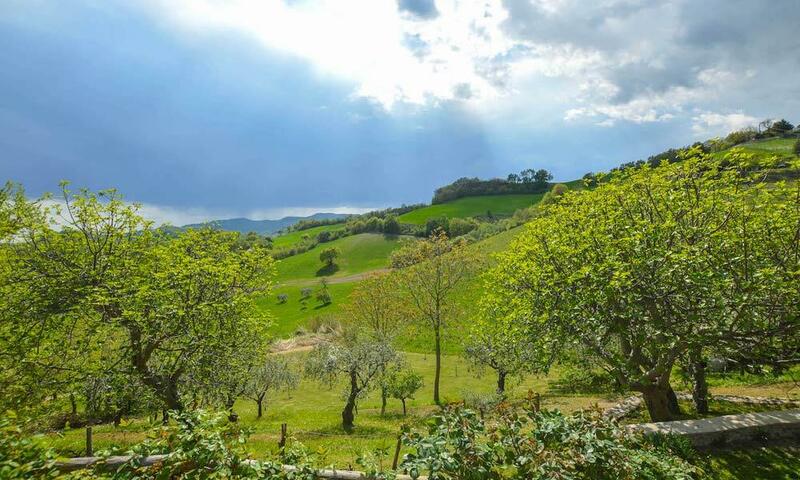 As a matter of facts, all around the house there are only valleys, so you are surrounded by peace and the beautiful colours of the marchigiano hills. 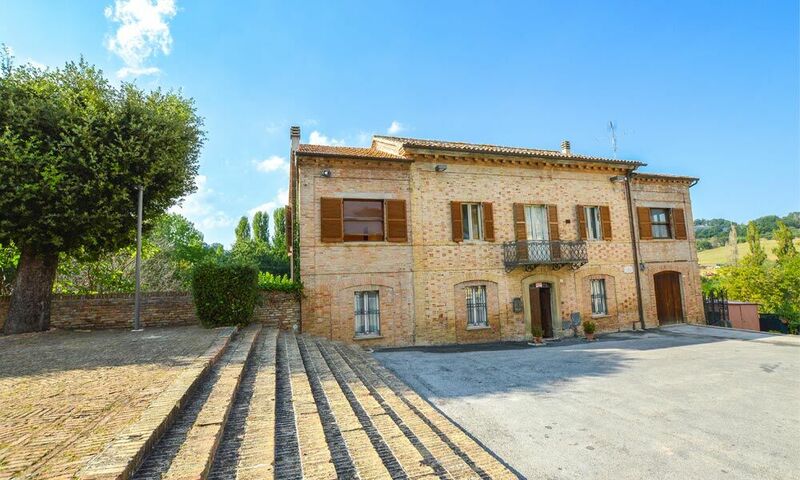 The property is conveniently located just 1,8 km away from the centre of Macerata Feltria, a nice town in the heart of the historic area known as Montefeltro, characterized by the presence of fortresses and castles, some of which are among the most interesting in Italy. 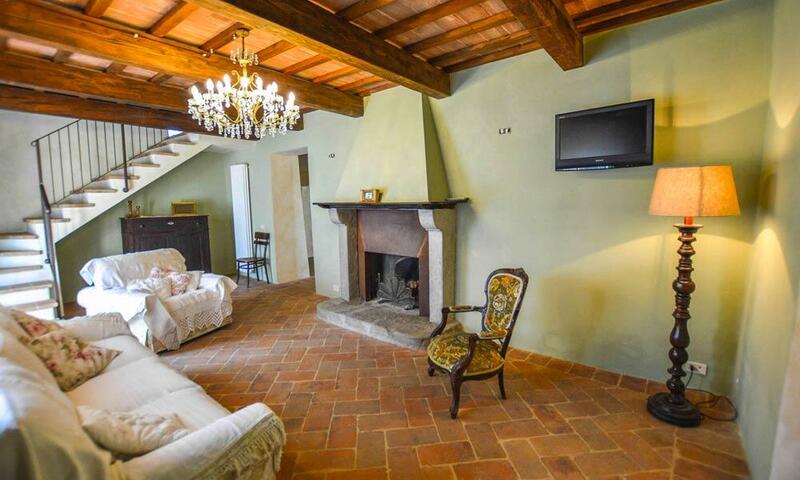 For those interested in renting the property, this is quite a convenient area, since from here tourists can visit many interesting places: first of all, in the town centre you can find a good Spa, since Macerata Feltria is well known for its thermal waters. 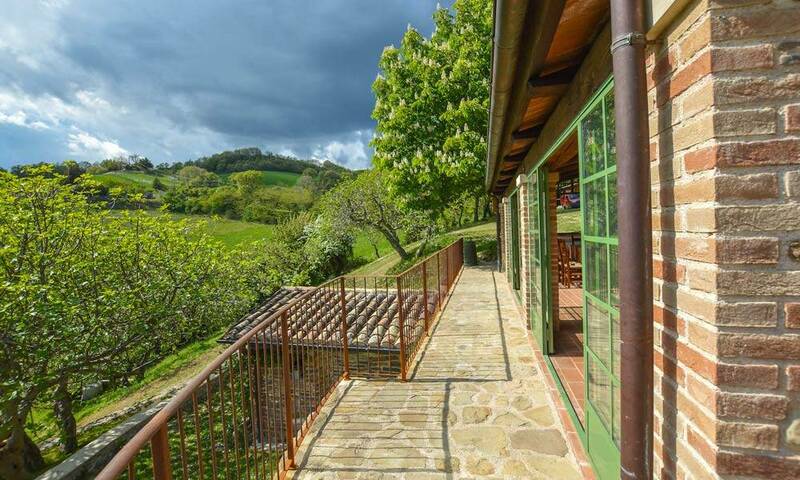 For those interested in exploring region Marche, you are quite close to many other places rich of history, art and culture. 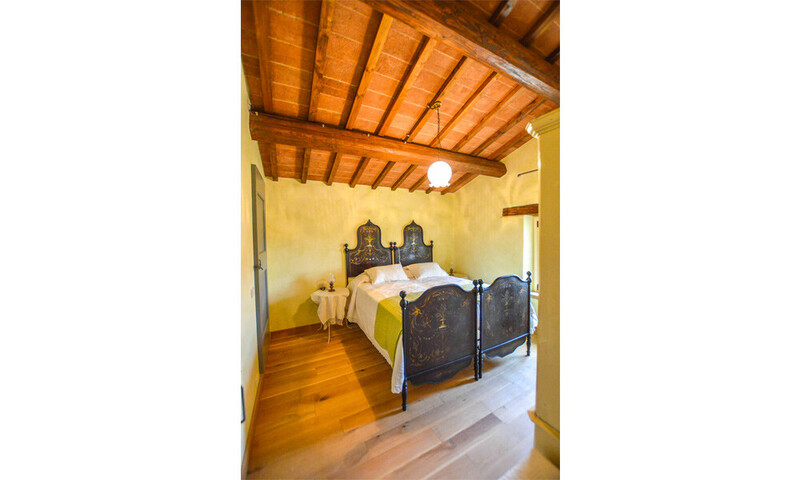 The first one to be quoted is for sure Urbino, also known as the cradle of Reinassance, which fully preserves the architectural heritage of the period. 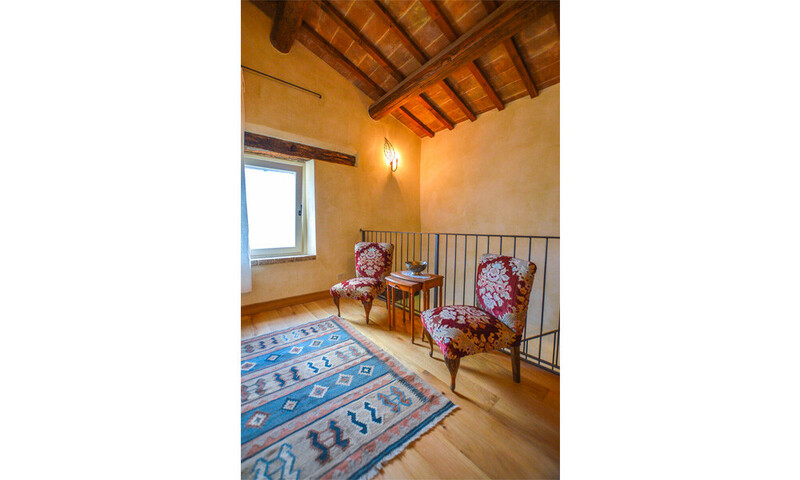 The historic centre of Urbino is listed in the UNESCO World Heritage Sites. 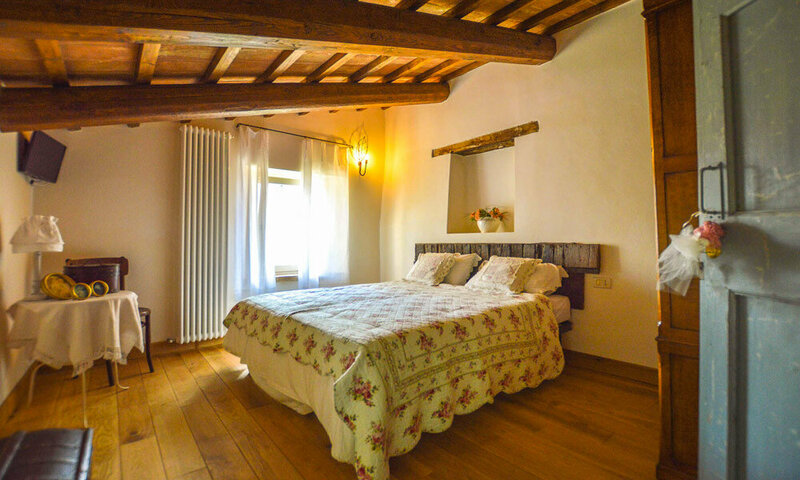 From here, it is very easy to reach and visit also other interesting places: the Tuscan border is just 15 km away, as well as the border of region Emilia Romagna, where you can explore places like lovely San Leo with its castle. 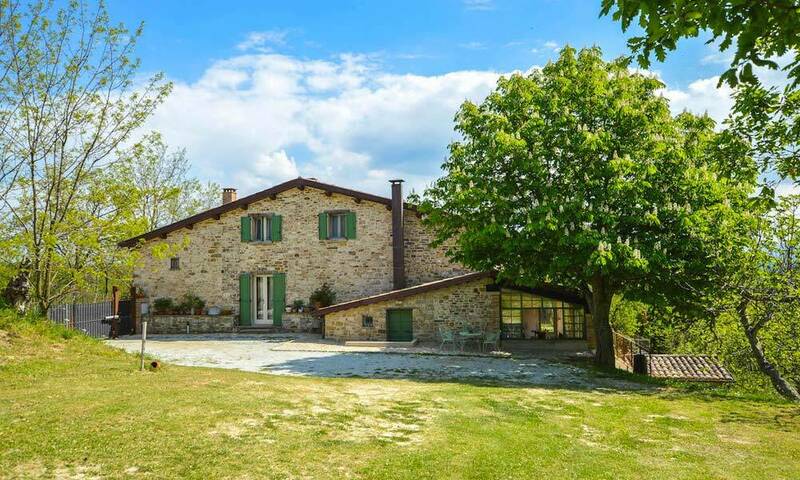 You’ll also have the possibility to “expatriate for one day” since the Republic of San Marino (the independent country inside Italy) is just 22 km away! And for the mountain lovers, you can’t miss the Sasso Simone National Park, as well as Passo della Gola del Furlo, where you can go hiking and discover wild nature. For sure, you will never get bored in this area of Italy! 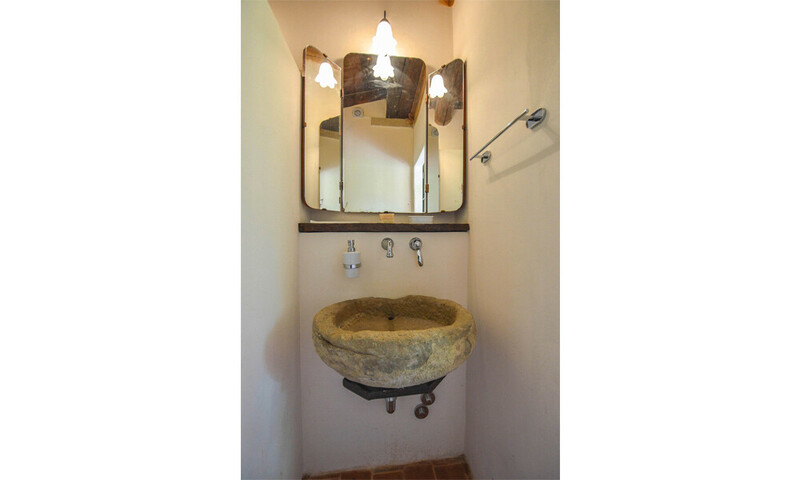 The renovation of this property began in 2013 and has been completed very recently. 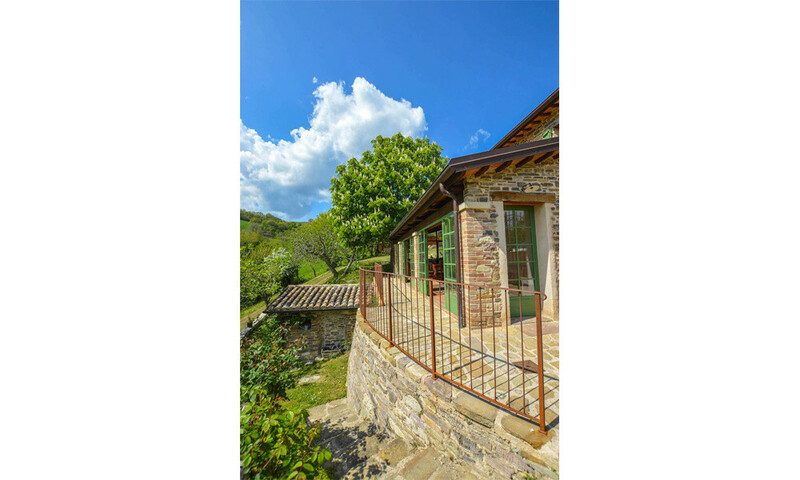 It’s a perfect blend of aesthetics and construction techniques: along with the choice of pastel colours that can be found also in window frames and shutters, you can appreciate the good job done with the ventilated foundations, ventilated and insulated roof, wall insulations, latest generation heating system and much more. 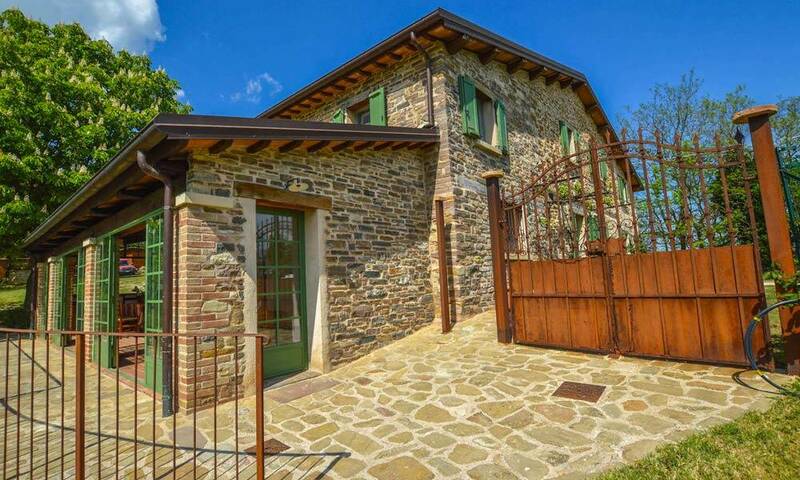 In addition to the quality of the construction and finishes of the property it is important to note the position of this farmhouse which, although secluded, is located less than 2 km from the center of Macerata Feltria. Moreover, being located in a small village consisting of 3 houses it can be safer for a family with children who, in any event, can always refer to neighbours. 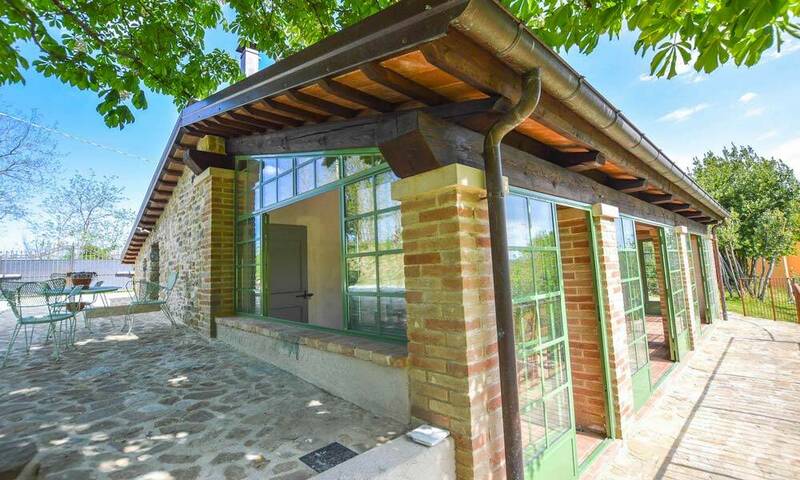 LAND / GARDEN: 2336 sq.m.